A Wild Adventure Awaits. 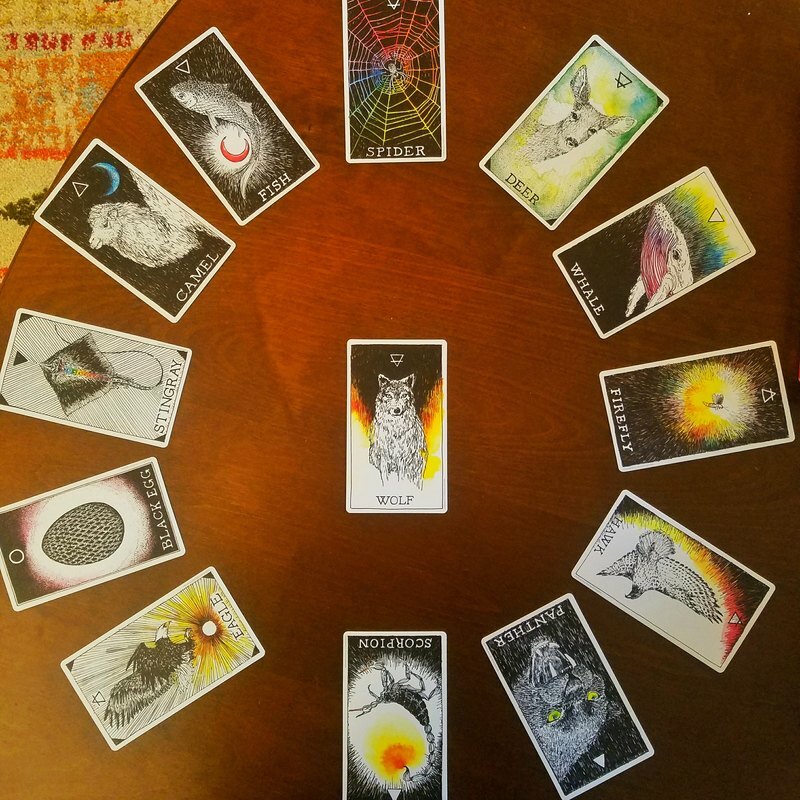 . .
Last January, I sat down with The Wild Unknown Spirit Animal deck and chose 13 cards. The one in the Center represented a general theme for the year. Each of the other 12 corresponded to a month. Pretty simple. I didn't have any particular agenda for doing this. It just seemed fun. The game ended up being much more impactful that I could have imagined. Each of the animal cards embodies an archetypal energy. It was interesting to peer into the year ahead through the lens of these energies and see what narratives emerged. As the year progressed, I found myself referring back to the spread at the start of each month. It's not that the cards were predictive, but rather that each one provided a lens through which to see and experience any given month. And, inevitably, that lens helped focus my attention which, in turn, inspired reflection and deepened my experience of the world. It was so fun, gentle, and impactful that I feel moved to offer a facilitated experience to a few folks as we move into 2019. One by one, we'll reveal each card and explore it both as a piece of art (the cards are stunning) and as a spirit helper. As we go along, my job is simply to offer reflection and gentle invitations to explore more deeply and become more present with what each card evokes. At the end of the session, we'll offer thanks to the cards and I'll send you a picture of your spread along with a PDF of descriptions of each card. The whole process takes 60 minutes. ​It's a unique way to explore, reflect, and enter into 2019 with a sense of connection and grounding! Here's where it gets really fun. I'm only offering 5 of these sessions and only between December 14th and 31st. We can work together in person or via video conference. I'm experimenting with different modes of exchange, so these sessions are Exchange What Feels Good To You 'pricing.' The catch is: no money allowed. ​If a handmade piece of art feels right, that's a great exchange. If a delicious meal feels right, cool. Spreading the word about my work feel good? Awesome! The idea here is to experiment, play, and see if we can create an exchange that is not purely monetary. Well. . .that's sounds fun and weird. I'm in! Great! This will be fun! Send me an email by clicking the button below and we'll set up your session.